VCC is rolling out two new LED Lamps for its distribution channels. New T-2 and T-1 3/4 Direct Incandescent Replacement LEDs Add Even More Convenience and Energy-Efficiency to Product Line. We are thrilled to offer our customers products they can use to easily replace their energy-wasting incandescent lamps with LEDs. These lamps are just the beginning of our push to offer clients all the benefits our LEDs have to offer. 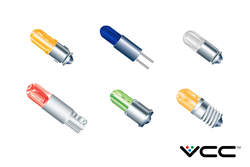 Visual Communications Company (VCC), a global leader in illuminated components is rolling out two new LED Lamps for its distribution channels. The T-2 and T-1 3/4 Miniature LED replacement lamps were added to VCC’s portfolio during its acquisition of Display Products, Inc. (DPP) in Q3 of 2017.